The 44-storey Mandalay Bay Resort and Casino is among the largest on the Las Vegas Strip with more than 3,000 hotel rooms and a 135,000 square foot (12,500 sq m) casino. The tropical-themed resort has a number of popular family attractions, including the Shark Reef saltwater aquarium and large-scale stage shows ranging from Broadway musicals to Cirque du Soleil productions. 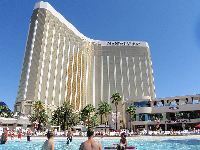 The most popular attraction at Mandalay Bay however, is Mandalay Beach, an 11-acre pool area featuring three heated pools, a wave pool, lazy river, and children's pool. Voted Best Pool of Las Vegas many times by Las Vegas Review Journal readers, Mandalay Beach has its own bar and restaurants.